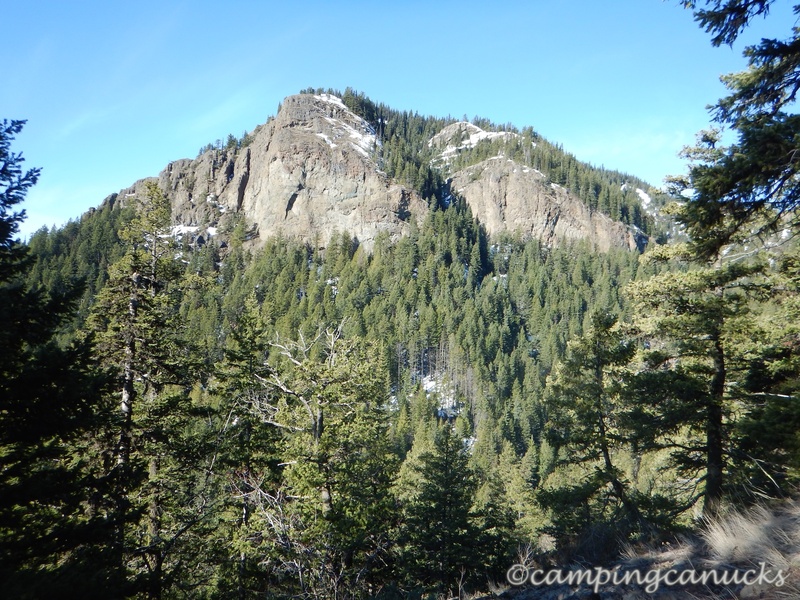 Estekwalan Mountain had been on our list of local areas to explore but we just hadn’t gotten around to it until our first attempt in November 2014. 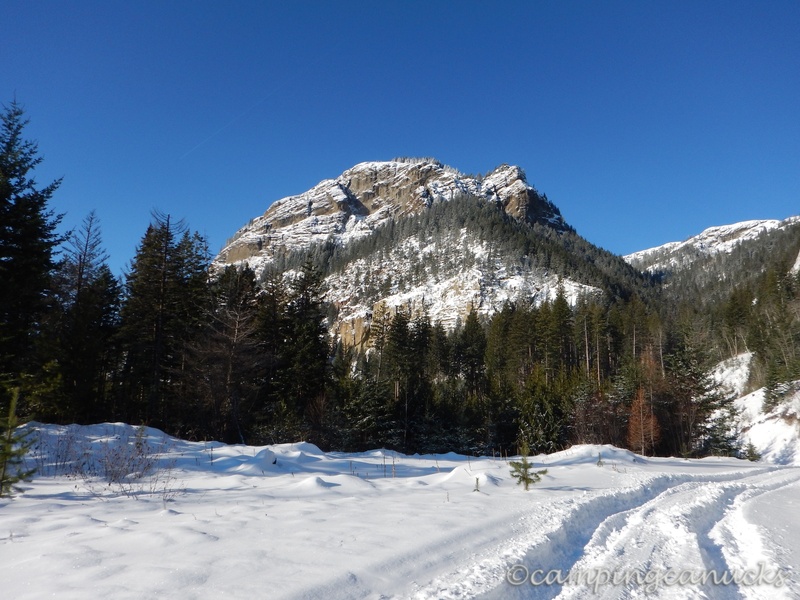 However, due to lots of snow blocking the road, we ended up parking several kilometers from the trailhead. Throw in -25 degree temperatures and we decided that we would have to come back another time when conditions were a bit more favourable. That was after we had hiked a couple of kilometers up the trail once we reached it on foot. 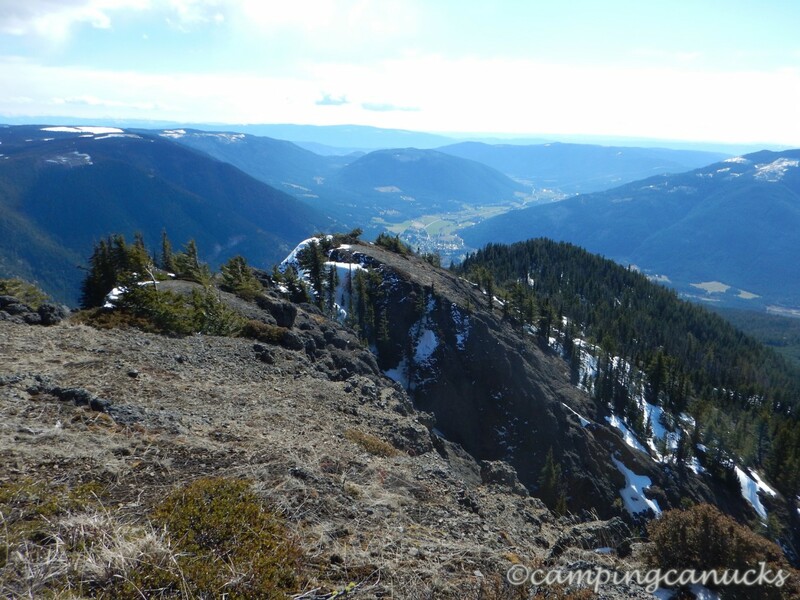 On my next trip, I organized it as a Kamloops Hiking Club event as Anthony was good with doing an early season trip up the mountain and we figured we’d see if there was anyone crazy enough to join us. We also had no idea of how much snow to expect so we suggested to anyone who came along to bring along snowshoes and/or spikes to deal with whatever we would happen to encounter. We were pleased to have an experienced guide come along as our guest. This time getting to the trailhead was not an issue as there was almost no snow on the road on the way up. We had also picked a great day with temperatures hovering around zero and very few clouds to be seen as we set out. After eyeballing the slopes and peaks that we could make out from the parking area, we decided to leave the snowshoes behind and just take our chances. We did encounter a lot of snow throughout the day but fortunately it had a very solid crust on it and we were able to walk on it most of the time. The trail starts out with a pretty good climb where we gained most of the elevation in the first few kilometers. It was made a bit more difficult by quite a bit of deadfall along the way and there was certainly more on the trail than I had remembered seeing the previous November. 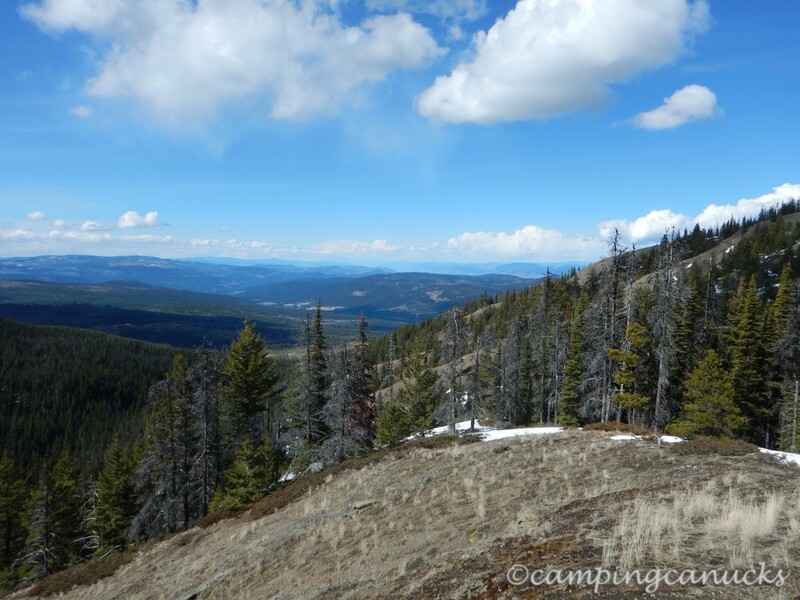 We also soon determined that the trail is a bit vague in spots but with some route finding, we were easily able to find the more direct way up. From time to time, we found ourselves following previous tracks that had likely been made within a day or two of us being there. 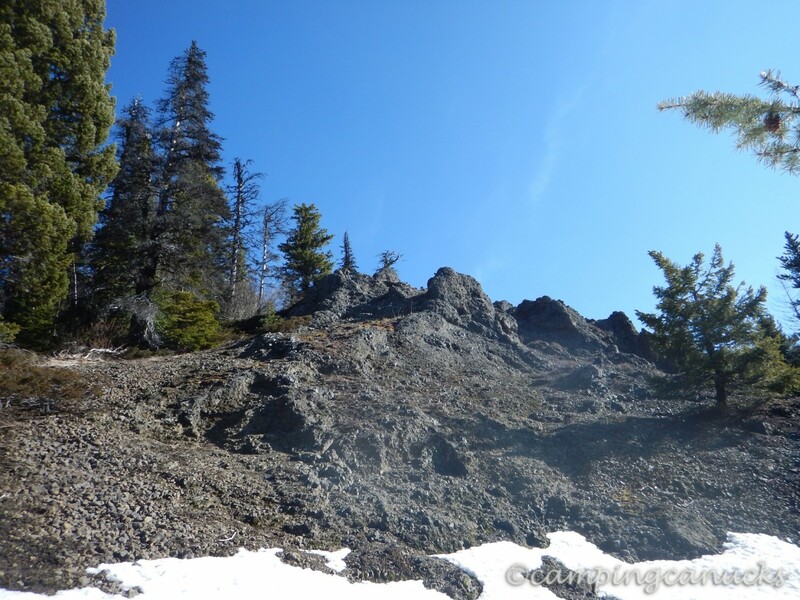 Once we neared the upper part of the treeline, we crossed the last bit of snow and scrambled up the bare rock onto the ridge. This was when the views really started to stand out. 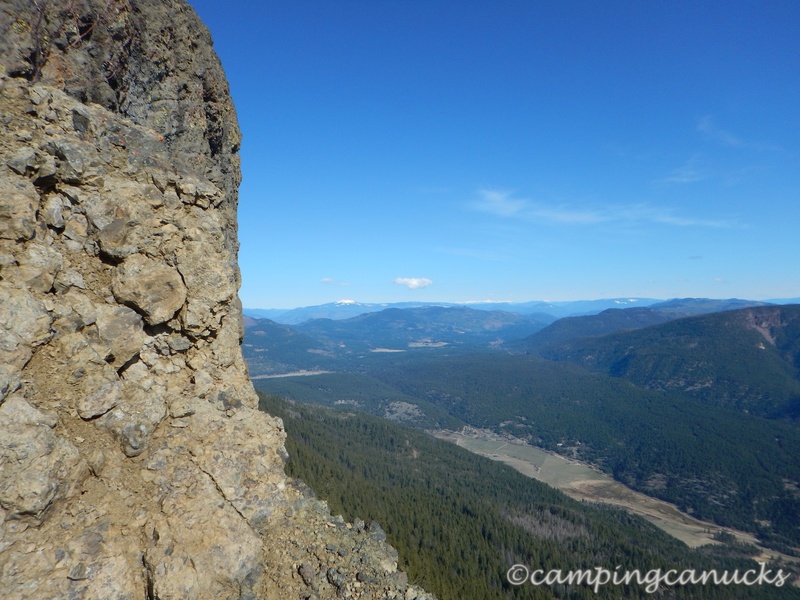 Once up on the ridge, we found ourselves below a somewhat daunting cliff. We explored around it to see if we could go up, but found that it was too risky to proceed along that route. We determined that we had to go down a bit and circle around the base of the cliff where we found another ridge leading up to the top. After a bit more scrambling, we now found ourselves enjoying what would be some of the best views we had all day. While we never had one spot in which we could see 360 degrees to the horizon, from this point it was close to it, with us being able to see mountain ranges in all directions. Admittedly it’s not quite a awesome as being surrounded by peaks but for an interior BC mountain, it was a pretty nice sight. 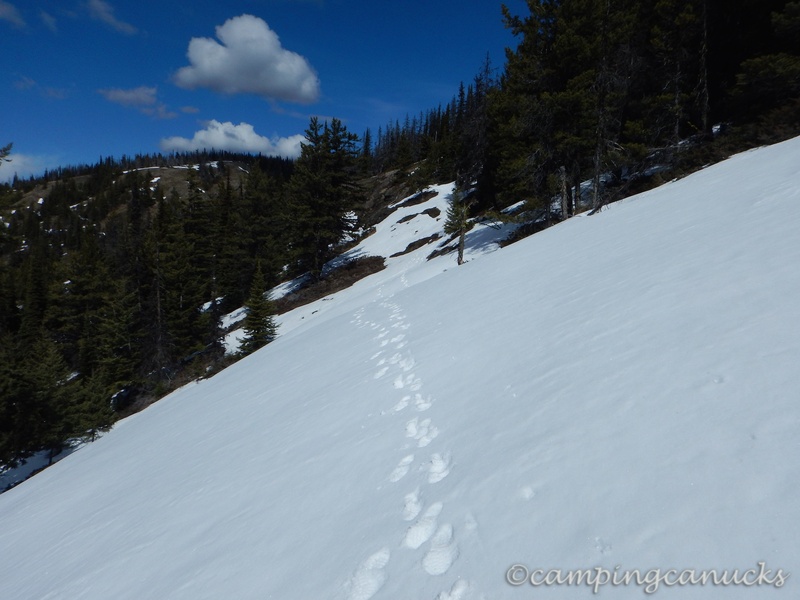 We continued on our way up the ridge and began to encounter more and more snow, particularly in the trees. We weren’t really on a trail that we could see but Martin had a GPS track on his device, so we looked at it once in a while just to make sure we were more or less heading the right way. Occasionally we would see a sign on a tree or something pointing out the trail but with the snow, we didn’t find them very helpful since we couldn’t see the trail itself. 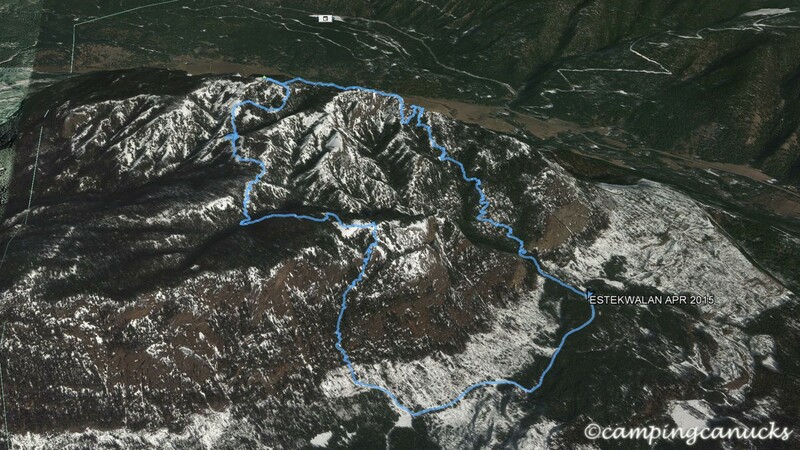 In addition to the track, we also referred to the various geocaches that are in the area and used them as waypoints to keep more or less with the trail. 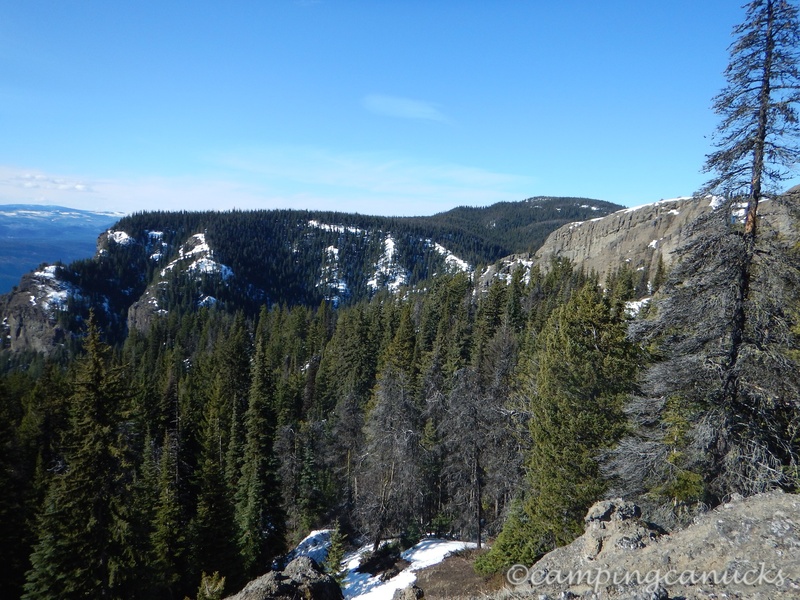 Much of the next bit was in the trees where we skirted the edge of the cliffs, paying attention to not get too close to the edge in case the snow was overhanging. The cliffs on the eastern side go a long way down. I couldn’t say how far it was but it was a bit vertigo-inducing peeking over the sides from time to time. We mused about how it looked like a good place to launch a hang glider or parasail. I believe Martin even mentioned rappelling down. We found ourselves a nice spot for a lunch break on a dry south facing slope and took the time to just relax for a bit and eat before heading around on the next leg of the trail. The next part was a bit tougher as it was a series of valley descents and ascents in order for us to make it over to Estekwalan Mountain itself. While the south aspect slopes had some snow, the northern aspects had a whole lot more. It wasn’t too bad but it did slow us up a bit as we were climbing our way back up each time. That said, in some ways it’s probably easier with some snow as much of the debris and deadfall was largely buried and we just walked right over it. After one last drop to a creek at the bottom of a valley, we started our way up to the top of the peak, following the sporadic and largely faded flagging tape that we would see from time to time. 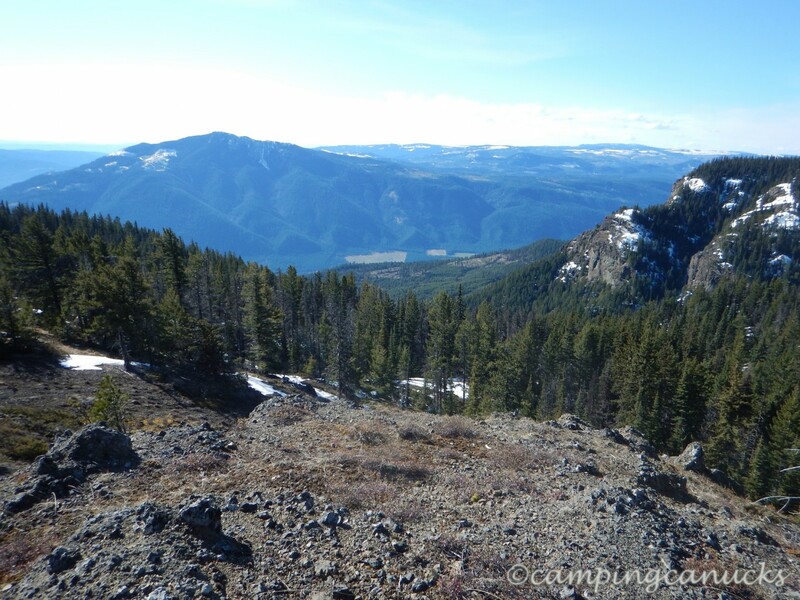 Once we found ourselves on the top, there was really not a whole lot to see until we reached the southern side of the peak overlooking the valley just west of Falkland. And once again using a geocache (Thanks Doug! 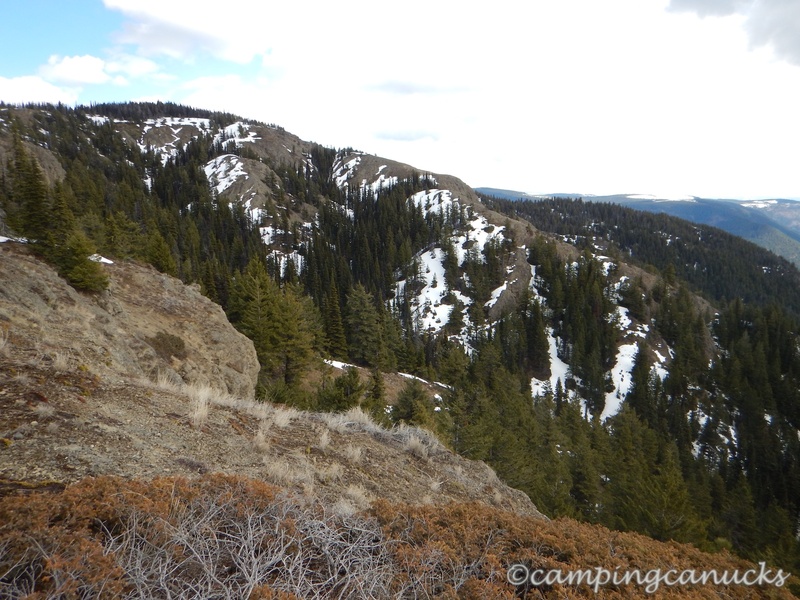 ), we found the trail that descended back down to the road far below. Unfortunately, I did not take any photos of the trip down but it was pretty damned steep. In fact, in a couple of sections, someone has hooked up ropes to assist with coming up. Personally, we figured the best way up was the way that we took on the eastern trail, as going down we lost 500 meters of elevation in 1.5 kilometers. That would be a bit of a grind coming up. The trail exited on the road about 1.5 kilometers from the parking area so we had a short walk back to the truck. It was a nice way to end the hike, even with the snow and mud. Estekwalan Mountain is definitely worth the trip. It was a bit more challenging with the snow, as there was no defined path to follow but for anyone with some basic route finding skills, it shouldn’t be too hard to do this trail. Of course, with no snow, one could just follow the trail as it would probably be visible.